Some children prefer to play outside or cook all day whilst others become wildly enthusiastic about mechanical propulsion and computers. This is why at Op Stoom we don’t just have After School Club but also Special Clubs. How cool is it to spend time after school doing what you just love to do? Children of the After School Club can participate in two Special Clubs. On Mondays we have the Kookstudio (Cookery Studio) On Tuesdays, for children that bounce with energy, we have SportClub Pim Mulier and on Wednesdays for clever clogs of 7 years and older the RoboClub. Here is everything about – yes indeed – cooking! Your child will learn how to cook independently and as part of a team. Special techniques like steaming, blanching, grilling and smoking will all be part of the course. We will cook with “whole” ingredients: we fillet an entire fish for instance and we use cinnamon sticks instead of cinnamon powder. And our fresh herbs mostly come from our own vegetable garden. And at the end of the season you can join the table at the Kookstudio dinner. Soup, starter, main dish and dessert. Your child will prepare it all and the whole family is invited! Have a look. A club exclusively directed towards open air sports and games. Have a look. Some quick drop-kick techniques in the soccer cage or a catchy throwing technique for a game of handball. Competing together in a fair way is what we consider top sport anyway. 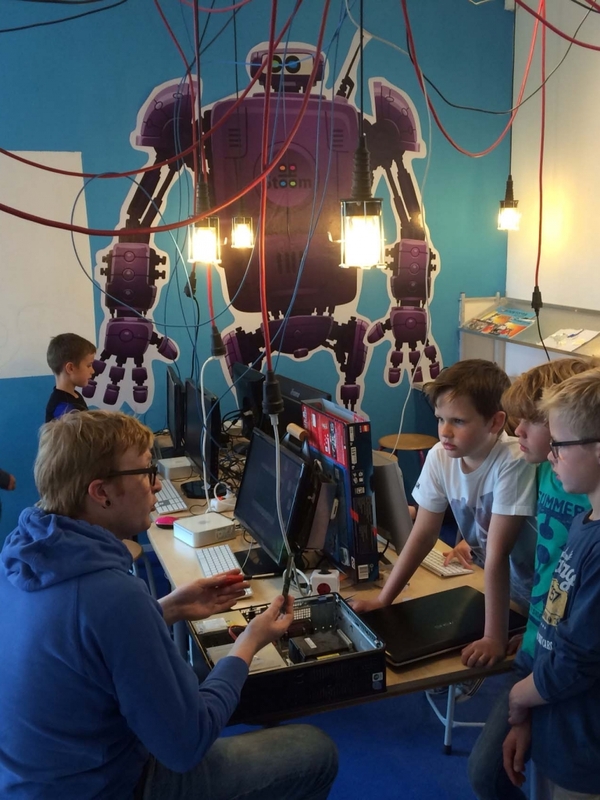 Exclusive for Haarlem: a Robolab filled with technical gadgets to build ingenious robots. Using advanced software smart kids build robots that can dance and maybe even do your homework for you. Do you have a whiz kid of seven or older who’s wildly keen on cables and computers? Or one that has an endless imagination about the way the world would look once they are big? With us they can work on holding the future in their hands. Have a look. All Special Clubs are under the guidance of Op Stoom professionals who continue to inspire and encourage with their expertise. For participation in the SportClub or RoboClub you pay the same price you normally pay for childcare that day at the After School Club. € 5,50 per session for the ingredients. This fee will be charged in two installments. Just your child’s cup of tea? Get in touch with the Planning department about the options via planning@opstoom.nl. Or phone us via 023 – 2302004. Each Special Club is a registered after school club. You can, just as with regular after school care, apply for childcare benefit with the Inland Revenue. Op Stoom takes care of transportation to the Special Club. You can pick up your son or daughter at the end of the day from their Club. Kookstudio: Hildebrandlaan 2 in Haarlem. When your child wants to stop at one of the clubs there is a notice period of one month. Your child can also choose to switch from the club to the regular daycare at the After School Club, inside the International School Haarlem. Does your child normally have an evening meal at the After School Club? The evening meal service temporarily stops whilst your child participates at the Kookstudio.